Evergreen shrub with pink or white single blooms - very fragrant. The leaves are often mixed with black tea to produce an aromatic drink. Seeds are processed to produce oil, which is used for cosmetics and as food. Hardy to 20F (-12.2C); height: 8ft. 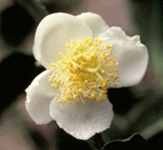 Small evergreen tree (usually pruned to shrub form) with 3 inch fragrant white blooms. This variety is the parent species that has been used to produce the gorgeous decorative garden camellias grown in warmer climates. The leaves are used to produce both green and black teas. Green tea is made by drying the leaves, black tea by fermenting the leaves before drying. Tea conossieurs very often prefer the tea made from a plant from a given area of the world (China, Ceylon, India) or blend the leaves with those of other plants, such as monarda to produce specific blends (Earl Grey). Medicinally, the Chinese use tea as an anti-toxic to releive coughs, headaches, and digestive problems. Tea compresses have been used to treat, among other problems, bruises, burns, and dog bite. The seeds are the source of tsubaki oil, used in soaps and hair preparations. Hardy to 20F (-12.2C); height: 30ft.